Skills-based job descriptions are the lazy person’s way to hire the wrong person. The right way to hire the right person is to define a job as a series of 5-6 performance objectives and screen candidates based on that. This doesn’t only make the job attractive to people who are open to changing roles, it also opens the talent pool to more diverse, high-potential and older people who are fully competent and highly motivated to do the work. For example, a major objective might be, “Lead the effort with design and operations to prepare a two-year product roadmap for the new widget line.” This is a lot better than defining the job as, “Must have an MBA, a technical degree, 6-8 years industry experience in widget design and a results-oriented attitude.” A subtask might be, “Within 60 days, review the current product roadmap and identify the major technical bottlenecks.” You can use a performance-based interviewing process that requires the candidates to provide detailed examples of comparable accomplishments. One way to develop performance objectives is by using a “Work Type” Analysis. 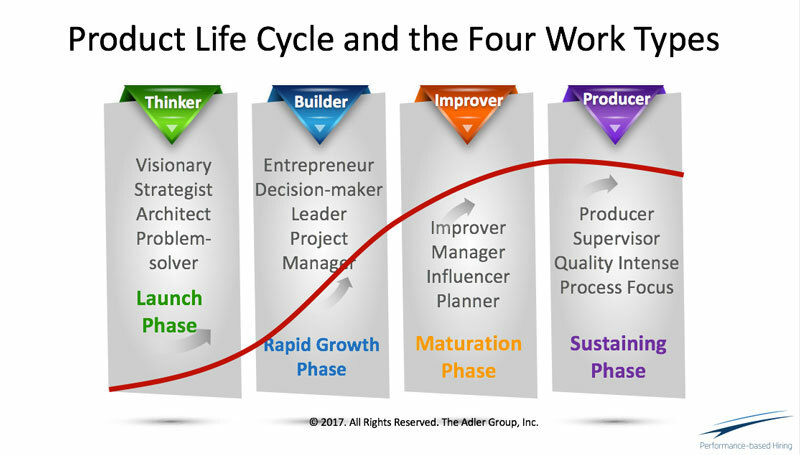 This approach classifies work into four categories that map directly to the classic product life cycle. This is shown in the graphic and described below. When opening up a new job requisition, ask the hiring manager to develop 2-3 performance objectives for each Work Type. When completed, put the objectives in priority order. One or two Work Types will typically stand out and this should be reflected in your job descriptions (see below for examples of how this could look for each Work Type). When it comes time to interview, ask candidates to describe their major accomplishments and assign these to Work Types. This is a great way to ensure a strong match between your job and the person’s intrinsic motivators. These people are the idea generators, strategists, and creative types. They’re at the front end of the growth curve, and their work covers new products, new business ideas, and different ways of doing everyday things. Sometimes they get in the way once the company or projects begin to grow. These people take ideas from the Thinker and convert them into reality. 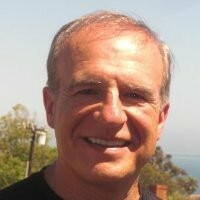 Entrepreneurs, project managers and turnaround executives are typical jobs that emphasize the Builder component. They thrive in rapid change situations, make decisions with incomplete information and can create some level of order out of chaos. They feel strangled in bigger organizations. “Rebuild the entire product management department in 90 days to support the global launch,” would be an example of a Builder performance objective. These are the people who take an existing project, process or team, organize it and make it better. In a moderately growing company they are charged with upgrading a new system, converting an outdated process or rebuilding a department. In a mature company they’re the ones that need to implement major and minor change despite heavy resistance. They are typically underappreciated yet have an enormous impact on a company’s long-term success. Technical skills dominate the Producer Work Type. A true Producer is someone who successfully executes a repeatable process on a regular basis. More often, the Producer Work Type is a component of the job, for example, combining problem-solving (the Thinker) with some technical process to implement a solution. The product life cycle can be considered a fractal for most types of work. A fractal is something that looks the same regardless of scale. Work is like this, too. It could be figuring out a simple problem and implementing a solution to launching a new business or turning around a failing organization. Regardless of the size or scale, most work requires a mix of different thinking, project management, process improvement and executing skills. Getting the scale, scope and mix right is essential for hiring the right person. Some types of work are more at the front end of the cycle, some bulge in the middle, some are heavily weighted towards process implementation and some are balanced throughout. Regardless, knowing how a job is weighted by these Work Types allows a company to write clearer job descriptions and better match people with the roles they’re being hired for, rather than hoping there is a good fit.